Summerlin, Nev. — The Sacramento River Cats (4-3) scored first once again but were held in check for the remainder of the game by Las Vegas Aviators (6-1). The River Cats would go on to allow five unanswered runs to drop game two of this three game series by a score of 5-1. Sacramento jumped out to an early lead for the second straight night on an infield single from Anthony Garcia and an Aviators throwing error which allow Stephen Vogt to score. After the first inning, however, the River Cats managed just four hits against Vegas righty Jake Buchanan and the bullpen. Aviators pitching was rock solid, holding the River Cats to six hits and giving up just an unearned run. River Cats starter Tyler Beede struggled to find a rhythm on Wednesday, piling up 79 pitches in just 3.2 innings, striking out five batters while walking three. The River Cats pitching staff walked a season-high eight batters. River Cats right-hander Shaun Anderson (0-0, 1.80) will be back on the mound looking to build off a strong start last Saturday night when he struck out five over five innings of work. The Aviators are scheduled to send righty Paul Blackburn to the hill. First pitch is set for 7:05 p.m. (PT). Catch all of the action live online at rivercats.com, on the MiLB First Pitch app, and on the air on Money 105.5 FM. 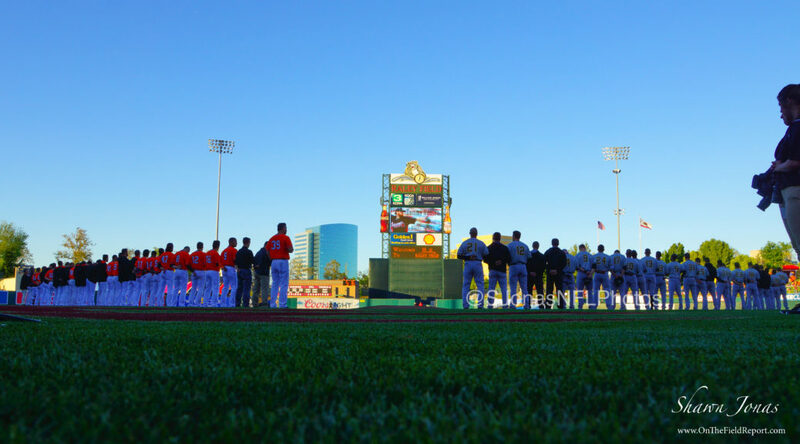 West Sacramento, Calif. — The Sacramento River Cats (3-1) picked up their third win in the first four games of the 2019 campaign, defeating the Tacoma Rainiers (1-3) 10-3 behind a pair of long balls from Jesuit High School alum and Sacramento third baseman Zach Green. Fan-favorite lefty Ty Blach got the start on Sunday, kicking off his return to West Sacramento after spending the last two seasons in the big leagues. Blach was tagged for three runs in the opening frame before settling down to blank the Rainiers over the next three. He finished his season debut with a no decision. The River Cats’ bats showed no signs of cooling off following their 11-run outburst on Saturday night, putting up a 10-spot on the visiting Rainiers. The club’s 31 runs this season ranks second behind only the Las Vegas Aviators. Catcher Stephen Vogt gave the River Cats the lead for good when he smacked a homer to dead center in the 5th inning, while Green added solo home runs in the 4th and 8th innings. The Sacramento bullpen closed the game strong again this afternoon, as Pat Venditte, Williams Jerez, and Sam Coonrod combined for five shutout innings of relief. The River Cats and Rainiers will close the book on their five-game set on Monday with RHP Enderson Franco (0-0, No ERA) making his San Francisco Giants’ organizational debut. Tacoma will send RHP Nabil Crismatt (0-0, No ERA) to the mound, who like Franco will also be making his organizational debut for his respective team. First pitch is set for 12:05 p.m. (PT). Catch all of the action live online at rivercats.com, on the MiLB First Pitch app, and on the air on Money 105.5 FM being at 7:00 p.m. (PT).